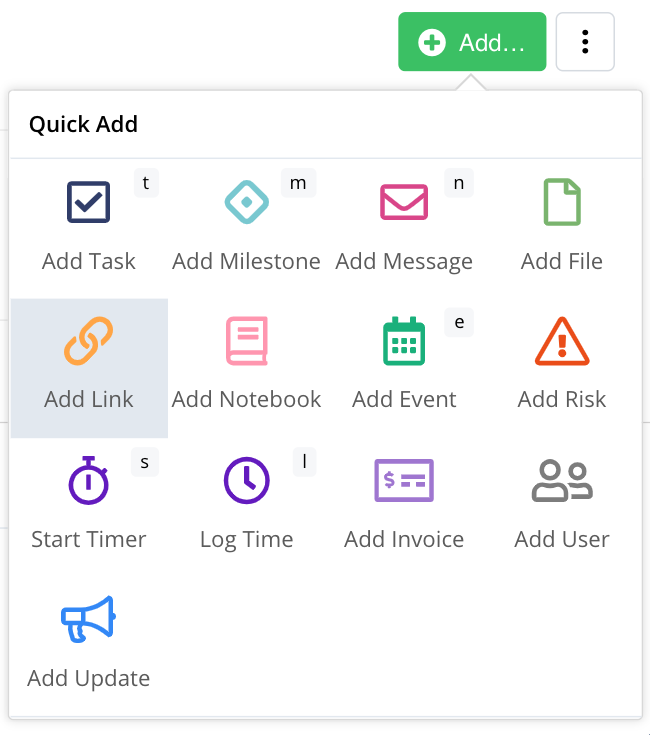 Within Teamwork Projects, you can store, categorize and tag links relating to a project for your team to refer to. To add a link, go to the Links tab of your project. Click Add a Link in the top right of the Links area. In the modal, you can add the link along with a title and description. Title: The title of your link, this is the main text that will be shown in the links area. Link/HTML code: The important bit. Here’s where you add in your relevant code, whether it’s a URL, Flash code, iFrame src etc. Description: A brief description of the link, which will be shown under the title. Choose whether to send an email to people about the new link. Category: Choose from an existing category or add a new one directly using the Add Category link at the bottom of the dropdown. Tag: Add tags to your links. Select from existing or create new ones. You can also add a link via the Add... option in the project's Overview tab.